It is an exciting year for the School District Demographics System (SDDS), which was developed by Blue Raster for the Department of Education’s National Center for Education Statistics (NCES). There are many new data updates including an initial release of School Boundary files. The announcement was made at the Esri Education GIS Conference in San Diego where Blue Raster’s Michael Lippmann and Brendan Collins presented NCES School District Mapping. The School Boundaries Geodatabase displays data for the 350 largest school districts based on enrollment, which is approximately 20% of the nation’s schools and approximately 38% of the nation’s students. The goal is to include the data for all school districts by 2015. 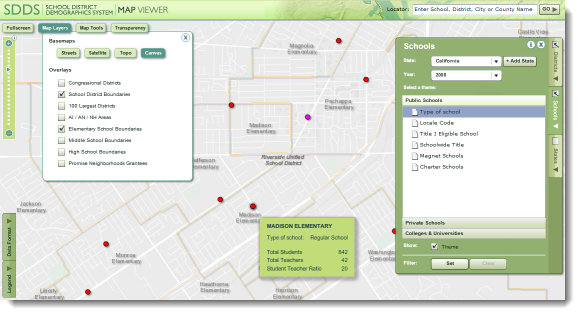 Developed using ArcGIS Server 10.1, the School Boundaries Geodatabase compliments the existing education statistics available through NCES.